A troubled circus was caught on film this week parading visibly distressed and scarred elephants in front of a crowd of onlookers in New York City. A massive female elephant stood stock-still on a stage in the Bronx on Thursday night, back-lit by neon laser beams. As a playlist of Top 40 songs blared from a speaker above her head, she stared at a point on the floor about 3 feet in front of her for a half hour straight, shifting only when nudged by the sharp metal stick carried by her handler. 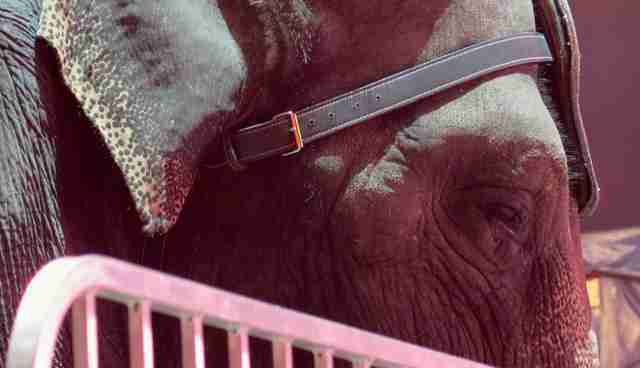 For this elephant and her companions at the UniverSoul Circus, Thursday night is every night. The show didn't start out well for the elephants. To begin with, an announcer continually referred to the animals as African elephants, though they are Asian elephants, a genetically distinct species. The show featured the animals rolling around on the stage, sitting on one another and perching on small stools. Most disturbingly, The Dodo captured footage of the elephants swaying back and forth, a behavior that has been categorized by multiple experts who viewed the video as "stereotypic," or repeated, obsessive behaviors that have been observed in distraught captive elephants. Dr. Lori Marino, executive director of The Kimmela Center for Animal Advocacy, told The Dodo that the large elephant in the video is exhibiting "head bobbing," a common stereotypy. "This is a very common sign of mental distress in elephants," she said. "Absolutely no question." Marino went on to say that this behavior is commonly seen among animals who are suffering stress from anxiety, severe boredom and mental or physical pain. 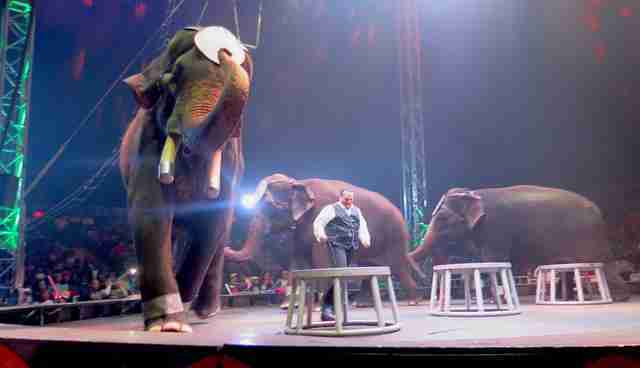 "This video exemplifies why circuses are incompatible with elephant well-being, let alone thriving," she said. "From the level of sound and commotion surrounding the elephants on display, it would not be too much of an overstatement to say that they are losing their minds." These behaviors can cause physical health problems for the elephants, too, according to Margaret Whittaker, animal behavior consultant and director of elephant care at The Elephant Sanctuary in Tennessee, a sanctuary that often takes in former circus elephants. Repeated abnormal movements can place excess pressure on the joints and structures of the elephant's foot, she explained to The Dodo. Whittaker also pointed out that two elephants have visible hook marks on their skin - the small raised round areas. Bullhooks are used in all performing elephant circuses; elephants can't be coerced into performing tricks and stunts without them. Whittaker, who has spent over two decades assessing and caring for Asian elephants, also said that the female elephant's posture looked abnormal. "She's holding her head very low and not moving at all ... she moves into the male's body almost leaning on him," she said. "Elephants are designed to move and are rarely seen standing still for long periods of time if they are in a healthy state." 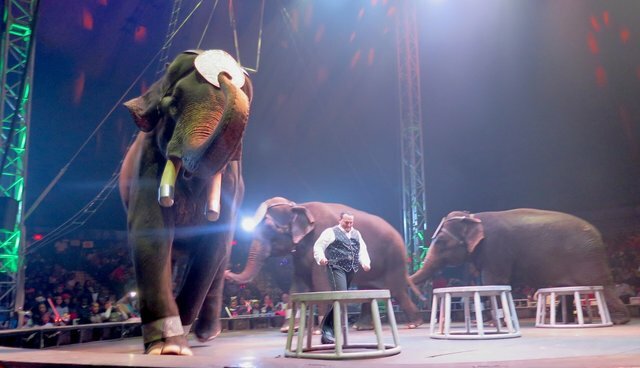 Dr. Philip Ensley, an elephant expert who has investigated UniverSoul Circus before, viewed The Dodo's footage and said that the handler stopped the male elephant from bobbing on stage. "In one of the videos the handler, Mr. Larry Carden, approaches Bo and in effect gestures for Bo to stop the behavior," he said. Ensley also agreed with the other two experts, identifying Bo's movements as stereotypic behavior. Multiple requests for comment about the welfare of the elephants were not returned by UniverSoul, a circus whose elephant troubles have been well documented. In February, an elephant trainer was accused of animal cruelty after he allegedly pulled an elephant off the stage by sticking a sharp metal baton called a bullhook into the animal's mouth. The incident occurred in Atlanta, where a local ordinance forbids inserting a bullhook into an elephant's orifices. The UniverSoul Circus is committed to the proper treatment of animals. We strongly oppose any form of cruelty or mistreatment of animals, wild or domestic - and will not tolerate any mistreatment on our circus site. In over 19 years and more than 10,000 performances, none of our animal vendors have ever been cited for animal abuse while performing at the UniverSoul Circus. That claim may be technically accurate, but it's not the whole truth. The UniverSoul circus doesn't own its elephants, so it must lease them from an array of outside exhibitors. One of these is a Florida-based vendor named Jorge Barreda. 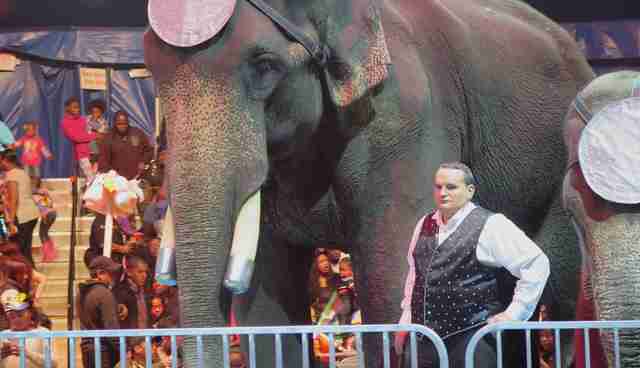 Barreda has received a barrage of citations from the U.S. Department of Agriculture (USDA) regarding the treatment of his elephants - just not during any Universoul performances. In 2006, the USDA cited Barreda for the horrific conditions found in an elephant transport trailer. An inspector found "dried and caked elephant waste on the walls." In 2011, the USDA issued an "official warning" to Barredas for failing to provide adequate veterinary care to all of the elephants. In December 2013, an inspection of Barreda's facility in Florida revealed an elephant with an untreated oozing sore on his face. Almost exactly one year ago, in March 2014, New York City officials required UniverSoul Circus to perform without elephants or big cats. The decision followed a ruling that the circus didn't keep its tigers in cages with adequate space and the elephants hadn't had current tuberculosis tests. It's not clear why the elephants were allowed back in New York City, but on Thursday night they appeared to be trying to cope with their circumstances, swaying side to side and staring blankly at a spot on the floor. The New York shows run through April 5 in the Bronx and April 26 in Brooklyn. 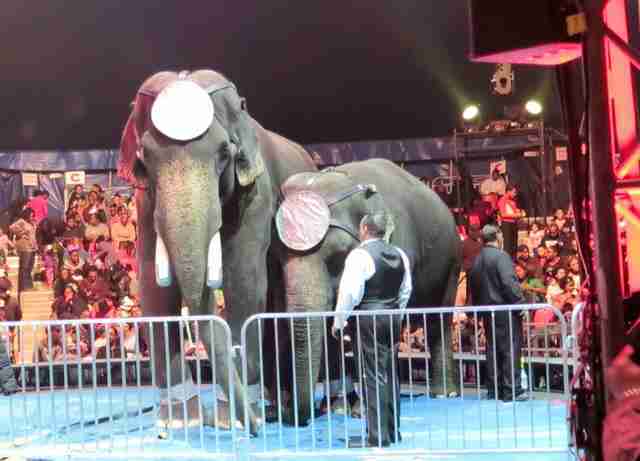 See this page to urge UniverSoul to follow Ringling's lead and end elephant performances.